Have you wondered what is actually in the boxed goods you are bringing home from the store? ​Have you grabbed and bought things without ever looking over the ingredients list? Do you have some not so healthy habits you know aren't the best for you, but you are not sure how to change them? Or you know how, but it seems too overwhelming? Are you desperate for convenient foods because your kids are little or your family is just always on the go, but you cringe at the thought of what you are letting your family eat day in and day out? Have you received advice from friends or medical professionals about changing your diet, but now you are left actually doing that without anyone to support you? Have you been wanting to make change in your kitchen, but are finding its just hard to do so??? Luckily for you, a Pantry Makeover is the perfect solution these and many more concerns!!! one list for "breakfast ideas"
another list for "lunch ideas"
the other list for "snack ideas"
and, yes, a list of "dinner ideas"
You STILL don't seem to be prepared for any of those meals, and yet you hate the thought of eating cereal for one more meal... or giving your kids crackers... yet again. And worse yet is the idea of gathering up your energy, finding some inspiration, beating the odds that THIS empty pantry could yield a nutritious meal for your family - and being greeted by complaints. "No, I don't have it in me tonight. I guess I'll go with crackers. Again." If your kids are out of the house, or you live alone, you may be wondering how to keep fresh ingredients fresh and find the inspiration to eat anything but frozen food. Personally, I knew I was having "kitchen issues" when I was walking into the kitchen every day- scratch that, THREE TIMES per day, and thinking to myself (in a totally deflated tone in my head), "I just don't know what to make for breakfast/lunch/snack/dinner." I totally get the repetitive-ness of preparing food for a family, typically several pint-sized members of which have a pretty ungrateful attitude about what, from their perspective, is a restaurant experience! It is hard to stay "fresh" in the kitchen when you are still trying to figure out how to make time to get to the grocery store! And on the other side of the coin, living in a home with a small family or by yourself presents it's own version of the same challenges. You WANT to eat fresh food, make salads, and be healthy... but you get so tired of the same thing all the time, and yet you don't know how to buy the variety you desire without the food going bad. Going through those thoughts on a daily basis (or when I was in that slump it was multiple times per day) is really draining. ​It is hard to be a parent, and every time I face a challenge I realize that being a GOOD parent is a helluva lot harder than being a bad parent! But I also realize that the investment now, when my kids are little, is going to pay off. ​It is NOW that I set the rules that, actually, it is not okay to eat crackers every meal. It is NOW that I build their taste buds, creating children and eventually adults who can appreciate an array of foods for both their flavors and their textures. And it is NOW that I really do have to figure out a plan to keep myself on track to make sure that our family is eating nourishing and tasty food every day. Yes, there is always a time and a place for "party food," but that should be limited to, well, parties (and other celebrations). The same goes for individuals. The sooner we make that change the easier it is. And the longer we put it off, the harder it becomes. You don't have to make the change alone. You don't have to try to sift through the shelves and find the foods you want to get rid of and be left without a next step. In a Pantry Makeover we do it together. You'll find no judgement from me - I TOTALLY get the fact that life is busy, and the food manufacturers and stores seem to be in cahoots to make you buy the slickly marketed convenience foods (that can be said for both mainstream markets AND natural markets!!!). What you will receive is a completely customized experience where we go through your pantry and answer YOUR questions and concerns. You will earn exact substitutions to try out, and can tell me in real time if that is way too far of a step, and if it is, we can find a middle ground. For example, maybe you like to rely on packaged soups for quick dinners... I may suggest searching out a lower sodium version for a super simple substitution, or I may suggest prepping frozen soup meals you can put in a crock pot - depending on where YOU are at with time, information, and ability to process the changes you are making. And of course, in your Personalized Report, I will always make sure I suggest a step one (substitute a lower sodium purchase) and step two (work up to easy crock pot soups) when appropriate. You will learn how to be a detective when it comes to packaged foods. Unfortunately the food manufactures sneak a lot of questionable items into the food they sell, and as shoppers we have to be vigilant about digging out the junk. Even in seemingly healthy foods you can find a lot of culprits. A motto I like to follow is "When in doubt, leave it out!" A Pantry Makeover is a fun and easy way to get a head start on your family's health! 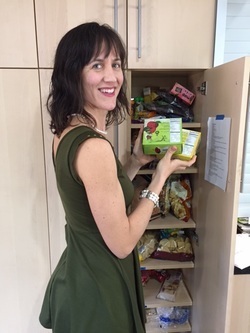 I join you in your kitchen (via Skype or Facetime), and I help you makeover your pantry! This program is designed to get you feeling GREAT about your kitchen space. We will go through your dry goods pantry first, where you will learn to more easily decipher labels to see which foods are best for you and your family. With this Pantry makeover you will gain the knowledge to kick the dirty sneaks off your shelves! And you will worry less about when your kids start digging in the pantry and helping themselves to snacks, because you will know that what you bring home from the grocery store are all wholesome choices. Did you know that an increase of just 2% of your calories coming from "trans fats" means a 23% increase in your chance of cardiovascular disease such as heart attack or stroke? There really are WORST choices, but after your Pantry Makeover you can remove every single trans-fat containing foods from your pantry, even the ones the food manufacturers claim have "0 grams trans fats!" I will teach you how. Of course you know the food giants have bought all kinds of brands and characters and make up all kinds of descriptive (often deceptive) language to make the FRONT of the package look great to your kids and you. But with this program you will learn to see past the hype and jump into the truth on the back or side of the package. "No, not that one, it's not good for your growing body." I know what it is like to struggle in the kitchen. That story above? Yup, that was really me. Staring at my lists of meal ideas and STILL feeling totally uninspired. And I am a freakin' health coach! So, the first step is: Don't be too hard on yourself. As mothers and parents we all get into ruts we have to get ourselves out of. Heck some days I find being HUMAN a struggle! ​And that is why I'm here. A Pantry Makeover begins to build a strong foundation of knowledge AND confidence for you in how you move forward stocking your pantry. That is going to feel so good. We start the hour with your goals and concerns and soon move into the pantry. The pantry is where most of the deceptive foods hang out. You can look at the box marketed as "healthy" on the front of the package, but when we flip it over and start looking at the ingredient list we may find out otherwise! There are always at least one or two hidden surprises when we start investigating the pantry contents! We will go over both nutritional information and ingredients, and how important it is to use them in conjunction. You will receive a handout to use during the Pantry Makeover, which you can print out and keep in your purse for your future shopping trips. The nutrition facts and ingredient lists fact checking guide is a simple but powerful tool that you can use to assess the health value of purchases from that point on. That is knowledge you take with you forever. These become powerful tools for teaching your kids to think about what they are eating without passing on the judgements that come from terms even as common as "junk food" . There is usually time to take a quick look into the contents of the fridge and freezer as well. Of course it all depends on how many items are on the pantry shelves, and what kind of questions and concerns you have! The good news about saving the fridge and freezer for last is that we don't have to talk on the phone for an hour with the fridge door hanging open. Yes, we can chalk up a win for the environment on that one ;) Also, perishable goods are generally healthier than shelf stable, so there is usually less to find in the fridge. Speaking of bonuses, in addition to the 60 minute Makeover at the price of $199, you receive these bonuses, an additional value of $198! 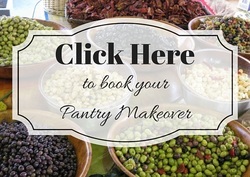 The Pantry Makeover includes a Personalized Report, which I send to you within 24-48 hours of the Makeover. This report is great to print out. You can use the report for encouragement, planning, or moving forward with action steps. Valued at $49. ​The Personalized Report includes goals & specific suggestions for your next shopping trip. 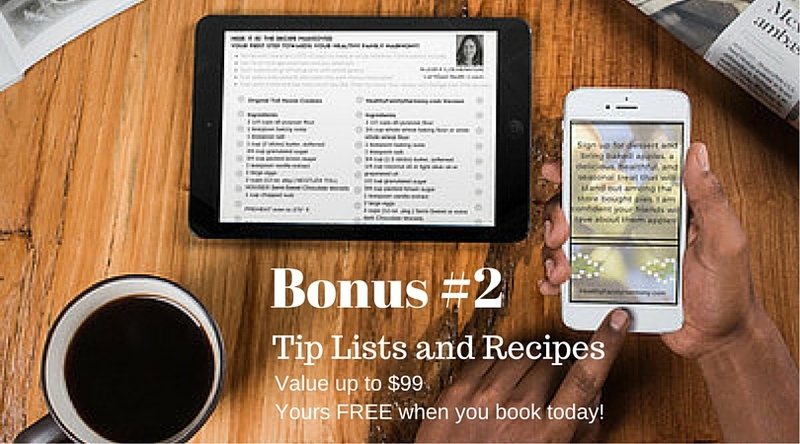 Along with your Personalized Report, I include Additional Tip Lists that answer questions that came up during our session (such as the Dirty Dozen Non-food Additives or How to Find Hidden MSG in Your Food) Or Recipes that address situations when you need to get out of a slump! Valued at $49-99. Not only do you get the Report to you to remind you of your strengths in the kitchen as well as places to begin making change, but you also receive a follow up 15 minute Skype or phone call with me to answer any questions that come up for you after the Makeover. Valued at $49. I know you will be inspired and thinking about so many changes you can start making in your kitchen, and this often brings up more questions! With a follow up Skype or phone call you can get support with those! That is up to an additional $198 of support, yours free when you book today! You will learn an easy way to identify which foods you should eat more of and which you should eat less of. You will start your next grocery shopping trip with a starter shopping list to begin making these choices. You will be inspired to advocate for your family's health! There are so many websites, so many resources on health and nutrition, it is hard to know where to start. As a Health Coach I pride myself in taking both a science-based approach AND guiding my clients down a path of moderation. It is important to enjoy your food, enjoy your meals, (enjoy your treats! ), enjoy you family, and enjoy your kitchen! Let's take the first step to get you there! 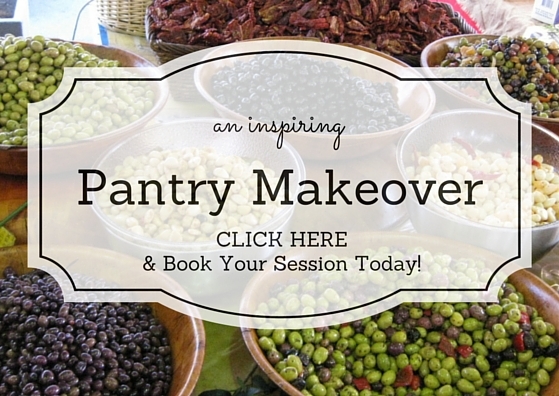 I join you in your kitchen (via Skype or Facetime), and I help you makeover your pantry! We will go through your dry goods pantry first, where you will learn to more easily decipher labels to see which foods are best for you and your family. We will go over both nutritional information and ingredients. You will learn an easy way to identify which foods you should eat more of and which you should eat less of. You'll walk away feeling GREAT, knowing what you are doing great, and with a list of action items to move forward. Sixty minutes; Skype or Facetime is required. This is a fun and informative sixty minutes; Skype or Facetime is required.